to one that is replanting seeds of community, interdependence, resilience, and sustainability." is a project of the Salmon Protection And Watershed Network (SPAWN) and Marin Municipal Water District (MMWD). 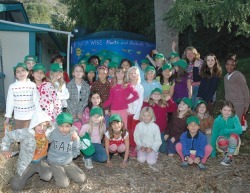 Launched in Marin County, California in January 2010, the project was designed to educate our community about the simple art and technology of rainwater harvesting, as well as its wide-reaching benefits - from lowering demand on treated water supplies for landscaping, to helping reduce flooding and erosion, to reducing strain on local sewer districts, to protecting local streams and salmon. Thanks to this partnership, our community-based program offers rainwater harvesting resources for FREE to residential and commercial customers of MMWD. Our goal is to expand these resources to be Bay Area-wide in future years! 10,000 Rain Gardens Final Report Available! recommendations for the future of the program is now available HERE! Through hands-on workshops, community project tours, presentations, demonstration and model projects at schools and public venues, technical and design assistance for landowners, and a roving educational exhibit (which will be visiting your town soon! ), the 10,000 Rain Gardens Project team has been working hard to make rainwater harvesting accessible and feasible for all. Why the "10,000 Rain Gardens Project?" The name for our project was inspired by a vision of a growing, worldwide grassroots effort to identify and pursue sustainable water futures that make a notable contribution to the improvement of the health and resilience of our precious watersheds and ecological communities. Individual actions taken on a large scale can make a huge difference! That is what motivates us! Manor School's Green Team with their 3,000-gallon roofwater harvesting system and raingarden design that supports the Ishi Bee and Butterfly Sanctuary garden.